Everyone was admiring mom’s new lap quilt in bright colors. I adore all the fabrics in this one. My mom always packs up her bag with the things she made since the last meting! I really like this habit of sharing, it inspires everyone to see what the others made and took time to create. No one believes my mom has a full time job when she pulls up one thing after another! Her production is impressive as is the quality of her work. 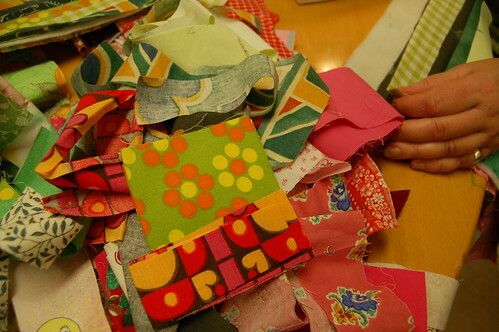 Bibbi is also making a lap quilt, my mom is showing her how to do the squares. 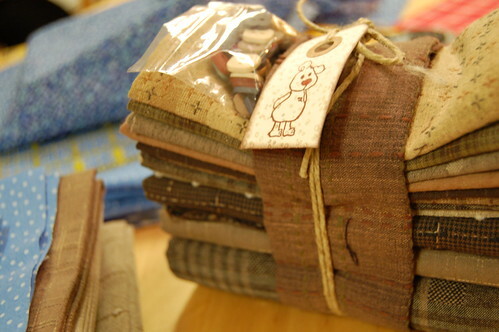 Fabric scraps, I just had to zoom in on the two on top. Very retro and so lovely! 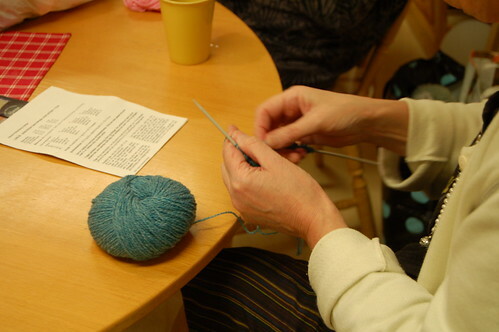 Ulla started her knitting kit from Hanne Falkenberg in Denmark. Beautiful colored yarn and very special pattern to knit. Embroidery going on. This one was red hearts on a black apron, but I didn’t snap a photo of it. Malin’s pile of brown fabrics bought at Syfestivalen. Yummy! Malin is also going to make a blue year quilt from Blockcentral. A one block each month-project, I think she said she is making the one from 2006 because she liked that one the best. 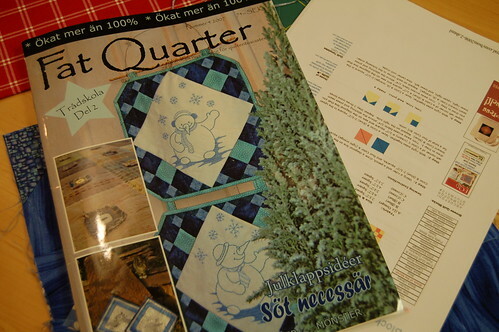 A Swedish Quilting magazine called Fat Quarter! This magazine is filled with inspiration, cool quilt projects and ideas. The magazine is made by one girl called Annika Pettersson and you can get a subscription (and I think you should if you’re a Swedish quilter) at her site fatquarter.se! 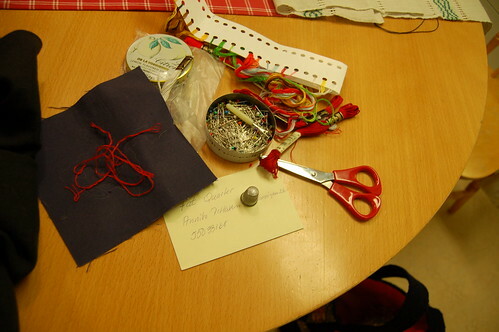 This entry was posted in A Creative Life, Quilting and tagged crafternoon, creating together. Bookmark the permalink. 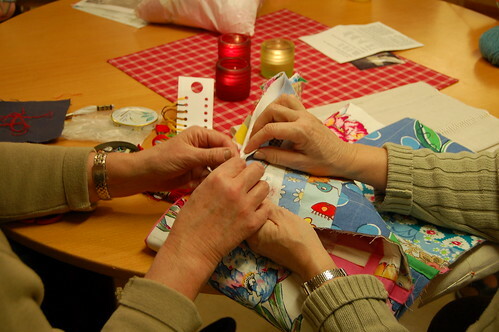 This looks like such fun – what a creative group of ladies! I am always so inpired when I read your blog. This post has inspired me to start a crafting night with some of my buddies. Maybe a small group with my church or something….. Thanks for the ocnstant inspiration! ok, that last comment I just left has so many spelling errors in it, I was mortified! Let me try again! I am always so inspired when I read you blog. This post has inspired me to start a crafting night with some of my buddies. Maybe a small group with my church or something…. ok, there. I feel better!